I read some upsetting news this week. A piece of my adolescence has died. The parent company of Columbia House—home of the legendary Record and Tape Club—has filed for bankruptcy. Once boasting more than $1 billion in revenue, the purveyor of music (and, later, movies) had just $17 million in 2014. The news of the bankruptcy hit me hard. I realize this probably sounds ridiculous. But I have so many memories of selecting the cassettes and eventually CDs that came with my membership, all for just one cent. Four to six weeks after my order was placed—penny taped securely to the postage-paid reply postcard—I received a stack of new music. There wasn’t anything better than coming home from school to find the cardboard box with the Columbia House name and logo and my name on it. 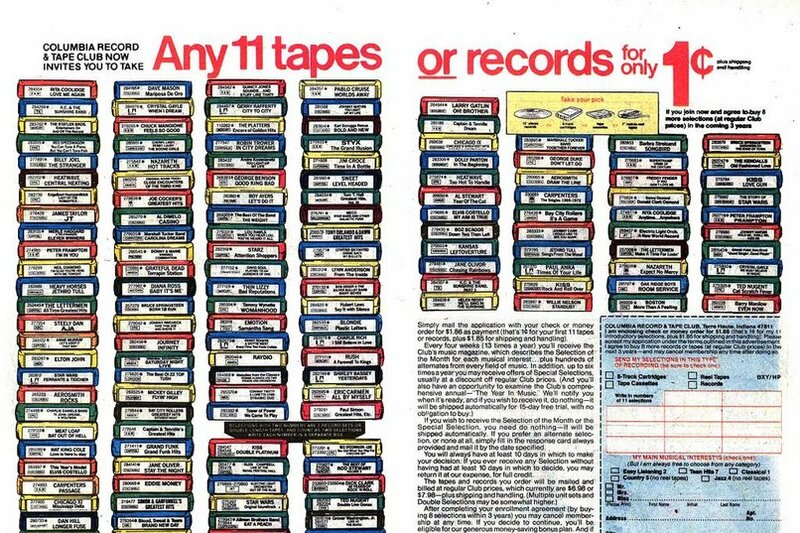 The Columbia House Record and Tape Club drew members like me with the promise of 11 tapes for a penny. Columbia House really was the music distribution innovator of its time. Founded in 1955, the company used broadcast and print media, along with direct mail solicitations, to promote the Club and entice millions of people like me to join. At its height, they had more than 8 million members. Columbia House delivered music—first in the form of records, then 8-tracks and cassettes, and finally CDs—right to its members’ mailboxes, and made buying new music almost effortless. Before the Internet and Napster, iTunes and satellite radio, the Columbia House Record and Tape Club was how I discovered new music. Sure, I could listen to the radio or watch MTV, but Columbia House offered me the opportunity to sift through hundreds of albums and choose what I wanted to hear. It helped me begin to express my independence and create an identity separate from my parents and siblings and other kids my age. There was nothing cooler than going to school and talking about a new (to me) band and realizing that none of my friends knew who they were. “You’ve gotta hear this!” became an oft-repeated phrase, and I never tired of introducing friends to new music. 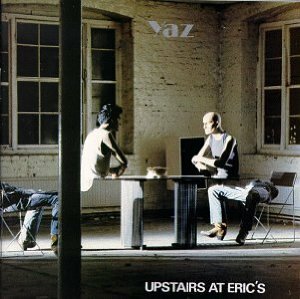 Through Columbia House I discovered the Violent Femmes, Suzanne Vega, the Guess Who, early Bruce Springsteen, and Yaz’s Upstairs at Eric’s, an album that still brings back vivid memories of high school (mostly good) whenever I hear it. My membership in the Club both broadened and refined my musical tastes, and helped me discover which music spoke to me—and which didn’t (I inevitably purchased some duds). Music remains an important part of my life; I listen to music far more than I watch TV. It helps me celebrate when life is good, and comforts me when things are tough. I veg out and work out to music, and create playlists for road trips, often themed to my destination. Of course, like a lot of innovations the Club wasn’t all good. After the initial windfall of music, I was obligated to purchase a certain number of tapes or CDs within a year. There was an album of the month selection I could choose to buy or not, but I could only decline by returning a postcard by a specific date. As a teenager, meeting Columbia House’s deadline wasn’t always my priority, so there was more than one month I had to fork over the money for an (overpriced) album I didn’t want. (I think this is how I ended up with Falco 3 featuring the song Rock Me Amadeus, which remains in my CD collection today.) First pioneered by the Book of the Month Club, “negative option billing” allowed Columbia House to recoup some of the money it invested when members signed on for a penny. The Club had downsides for recording artists, too. They received greatly reduced royalties, and sometimes none at all, on their albums that were sold through Columbia House. Additionally, the Club didn’t typically buy albums from the record labels. Instead, they pressed their own copies which was much cheaper for the Club but bad for the labels and their artists. The Columbia House Record and Tape Club model may not have been perfect for me or fair to artists, but it opened up a world of music I might never have discovered otherwise. While today Spotify and iTunes help me find new music, teenage me will always remember Columbia House fondly. RIP, Columbia House Record and Tape Club. I won’t forget you.